At Utopia MedSpa, we offer FDA approved, non-surgical facial rejuvenation using Botox Cosmetic® and Dermal Fillers. Botox is used to reduce wrinkles and lines caused by movement of facial muscles. This is a quick and minimally invasive procedure that lasts approximately 3 months and can be done on all skin types. Patients who use Botox generally have a more relaxed and refreshed appearance. Dermal Fillers are used to replace volume loss in the face or to fill in deep wrinkles or gaps. Unlike Botox, which relaxes the facial muscles, fillers will replace the volume under the wrinkle and plump the skin to appear more youthful and smooth. Ask your health care professional which products are right for you. Silk Peel Dermalinfusion A breakthrough treatment that combines non-invasive exfoliation with infusion of skin-specific solutions to improve and revitalize your skin. “Wet Abrasion” offers you a soothing treatment with immediate visible results and no downtime. Safe for all skin types and tones. Cutera CoolGlide Laser Hair Removal The Cutera CoolGlide is the best laser hair removal system on the market for all skin types and tones, from light to dark, including tanned patients. Its unique design, longer wavelength, and innovative cooling design allow extremely effective, safe and permanent results. Experience the CoolGlide difference! Laser Genesis Skin Therapy The Laser Genesis procedure utilizes non-invasive laser technology to safely, discretely and effectively treat fine line wrinkles, large pores, uneven skin texture, diffuse redness and scars. You can expect to see subtle yet consistent results after each treatment, without unwanted side effects such as bruising or excessive skin irritation. Treatment is described as relaxing and therapeutic and most fall asleep during procedure! Skin Titan The Titan utilizes a safe infrared light to hear the dermis well below the skin’s surface. During the procedure, the skin’s top surface (epidermis) is protected through continuous cooling with the Titan handpiece. The face, neck, arms, knees and abdomen are all areas that can be treated. Get skin tight in a new light! IPL/Photo Facial A light-based procedure which addresses problems right at the skin’s surface – redness, mottled complexions, freckles and sun damage. The Pearl The Pearl procedure is FDA approved and combines the impact of resurfacing lasers with the gentleness and safety of non-invasive procedures to treat aging and sun-damaged skin. Pearl reduces wrinkles, uneven texture and solar damage with fewer treatments and less overall recovery time than other technologies. A safe and effective treatment for restoring the skins natural pearl-like glow. CoolGlide Vein Therapy Now men and women alike are making unsightly facial and leg veins a thing of the past, thanks to Cutera CoolGlide. No more painful injections! With the most advanced technology, a unique design, and a longer wavelenghth, the Cutera CoolGlide can safely and effectivley treat both tiny superficial facial veins and deeper blue reticular veins on all skin tones. The Ultimate Utopia Facial (1hour 30 min.) This treatment is like no other. The Ultimate Facial includes; a gentle deep cleansing, exfoliation with our medical SilkPeel Microdermabrasion, steam and gentle extraction are followed by an analysis of your skin. A personalized mask to best fit your skin type is applied while you enjoy a deep relaxing massage of the face, neck, shoulders and declotte. Personalized medical skin care products are then added to your skin during the final step. 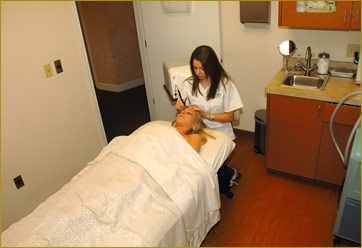 The Acne Treatment Facial (1 hour) This facial is especially for people who are vulnerable to break-outs. This treatment includes; a gentle deep cleansing, a masque to purify the skin, steam and gentle extraction, a deep relaxing massage of the face, neck, shoulders and declotte, a second masque to calm the skin finished with an application of medical skin care products to control break-outs. The Deep Cleansing Facial (45 min.) This is our mini, but effective facial. Start off with a deep gentle cleansing, our medical SilkPeel Microdermabrasion, steam and gentle extraction. Personalized medical skin care products are then added to your skin during the final step. The Exfoliating Back Facial (1 hour) For the neglected and hard to reach area of the body. This treatment includes; a deep gentle cleaning, a medical SilkPeel Microdermabrasion, steam and gentle extraction, a personalized masque and a deep relaxing neck massage.